Merlin is constantly innovating and is not afraid to experiment with new and unique activities in the name of entertainment. Underwater Fire Juggling combined with escapology is Merlins latest spectacular invention. Bound in eleven metres of chains he has a helmet placed on his head. This is then filled with water. Holding his breath, Merlin escapes from the chains. 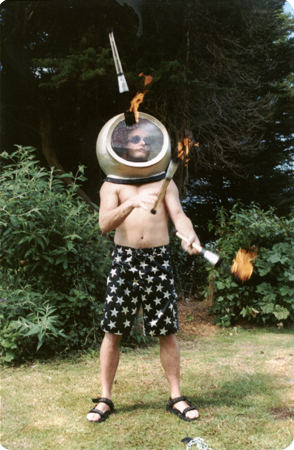 He then continues to hold his breath whilst juggling with fire. Finally he removes the helmet and draws breath. Surely no-one has ever performed such a crazy feat of daring in front of a live audience..and lived to tell the tale!